This Brasilian parrot lives free on a tree at one of the most important avenue from Guarujб Beach. It is very friendly and when we say "arara" it came at us waitting for some fruits. Great capture with beautiful colors!!! A very sharp, interesting shot with nice colors! 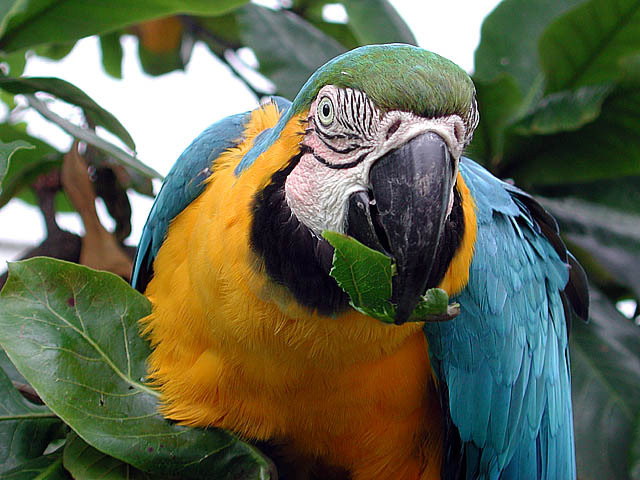 Very beautiful parrot! Also is photographed wonderfully. What can I say? This is so totally wonderful! One of the must beautiful bird of the World! A very beautiful photograph. My congratulations, Rosa Maria. Excellent capture, very beautiful , Rosa! excellent portrait of this arara, Rosa Maria!!! just in the right moment! Stunning...Superb colours and fine details.